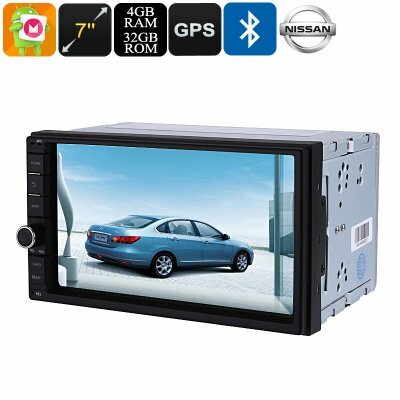 Successfully Added 2 DIN Car Media Player 7 Inch Display, For Nissan Cars, Bluetooth WiFi 3G&4G Octa-Core, 4GB RAM, GPS, HD Display, Android 8.0.1 to your Shopping Cart. Bring hours’ worth of entertainment into your car with this 2-DIN Android Media Player. This cool car gadget features a universal design that fits all Nissan vehicles manufactured between 2003 and 2017. It comes with a 7-Inch HD display on which you and your passengers can enjoy movies, games, and more. Thanks to its WiFi and 3G dongle support, you’ll even be able to browse the web straight from your dashboard. It provides you with access to the Play Store, meaning that you’ll have access to an unlimited source of free entertainment. From now on, not a single moment of boredom will ever be experienced again in your car. The next time you’re out on a road trip or holiday abroad, you’ll have all the means necessary to entertain your kids and passengers throughout the entire trip. Besides offering plenty of entertainment possibilities, this 2-DIN Android Media Player also features a highly-accurate GPS navigation system. Working on Android maps, this GPS navigator will lead you the way to your upcoming destinations. From now on, you’ll never have to worry about getting lost in an unknown city again. It supports 20 channels, meaning that this navigation system treats you with extremely accurate readings no matter where you’re at. With 32GB of internal storage, there is enough space for you to store all your Android maps along with all your other media. This 2-DIN car entertainment system runs on the Android 8.0.1 OS. Thanks to this, you’ll be able to enjoy a smooth user experience. With its Octa-Core CPU and 4GB RAM, your car gadget is capable of tackling all regular Android applications out there. You’ll be able to browse the web and use the latest software features without ever slowing down your device. It furthermore features an easy to install design and it supports CAN BUS. The latter allows you to control its basic features such as volume adjustment through the buttons on your steering wheel. Whether you use it for entertaining your passengers or for its GPS navigations, this Android media player is sure to meet your demands. This Dual-DIN car media player comes with a 12 months warranty, brought to you by the leader in electronic devices as well as wholesale electronic gadgets..